It was true when Ryan announced on Saturday night, “Man, this is the lowest of the low and the highest of the high.” Electric Daisy Carnival 2012 is the biggest one, with over 300,000 people celebrating together. It’s hard not to have fun at a massive party like this, but not without any mishaps. With this many people anything is possible, good or bad. People laughed, smiled, danced, hugged, cried, screamed, fought, and went through all kinds of emotions. But what makes everything magical was that we were all in this together. We all had our own funny stories, our bad news, our good news, our new friends, and our lost friends. Through all the frustrations of hours of waiting for a cab ride, paying for a limo instead and the limo breaking down 5 minutes away from the hotel, we all held our frustrations because negativity would fix absolutely nothing. That this mishap is happening to all of us, and all we can do is look at each other through tired eyes and think about how perfect Friday night at EDC was. 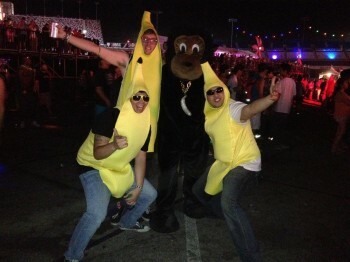 Friday night at EDC was indeed perfect. 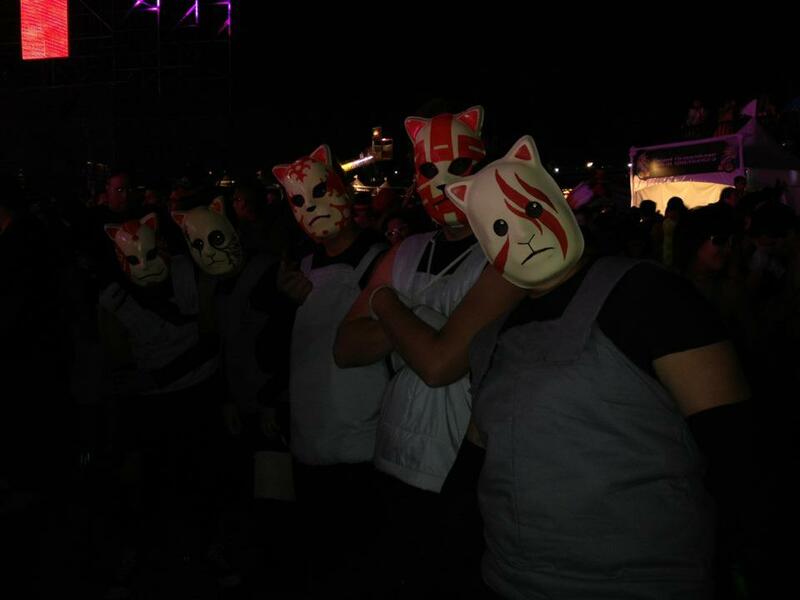 We all met up at the meeting spot, kept the group of 14 people together throughout the night (impossible at massive events like these), met new people, took tons of photos, saw our friends let loose for the first time, danced with strangers, danced to our favorite DJs, exchanged phone numbers, received compliments for our costumes, awed at the same fireworks, and saw the sunrise together. Sure, earlier that day, we had to deal with legal issues, not finding a cab to get to the event, traffic on the way there, crossing multiple accidents. What I’m thankful for is that our group’s health was completely safe. No one got trampled, no one was put on a stretcher, no one was dehydrated, no one got sent out with an ambulance. All I can remember were the smiles that we exchanged all night, saying how much we love each other and appreciate how much we’ve all done together that is completely incomparable to anyone who has never been to EDC. These guys learned how to sew together. Collabo costumes bring friends closer. I’ve heard of worse news from others. When Saturday night got cancelled due to high winds, I mentioned how it would be terrible if people purchased Saturday tickets only. They would only be going to a cancelled show (we did find out later that they were able to get into the event on Sunday). Another guy mentioned that he knew someone who purchased a 3-day ticket from someone only to find out a week before the event that it was a stolen ticket. Thousands of people around the globe tried to go to EDC and failed. We were the lucky ones. When the event was cancelled, and everyone was scrambling to the bleachers to keep us partiers all safe, my friends met a girl who cried because she lost her friends in the mess, and they didn’t have a meeting spot. I would’ve hated to be that girl. We all have our own stories. We were all in this together. Sunday night was better. I saw people fall in love, make new friends, hugged like there was no tomorrow, saw old friends we haven’t seen in years, jumped up and down like life depended on how hard you rocked to this song. Mikey G. even met some girls from Korea, and lost his shirt to them. Suddenly, the world was smaller because we all decided to come to EDC. We walked around in our banana suits, and kept getting stopped for a photo. We took photos with other bananas at the event, a cow and a banana who hugged us shoulder to shoulder and sang, “Banana milkshake! Banana milkshake!”, and a monkey who was just perfect for us bananas. You don’t see that every day in life. Sure, I went to the event to see some DJs, ride the ferris wheels, and see some art installations. But what I specifically came here for was the people. I came here to meet up with friends from Jersey who flew down to this event. I came here to celebrate with the people I snowboard with during the winter. I came here to party with some old, high school friends. And I came here for the thousands of people who purchased a ticket, drove miles, and was lucky enough to make it to EDC. To see their costumes, to dance with them, to smile with them, to hug them. One girl asked if she could take a photo with me because of the cute costume I am most proud of to have sewn myself. She will never know that she made my night. To the guy that gave Ray his first kandi from a stranger because he’s a fan of the anime, Bleach. The kandi says “Bleach” and Ray saw that it also says “Quincy”. 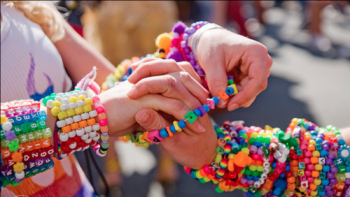 That guy will never even know what this kandi really means to Ray. Think about that. People spent time and sweat making something pretty to give to strangers. To the people I complimented on their costume, the people that complimented me on my hair, the people that took photos with us. We will all be forever etched in each others’ memories, with friends we will remember for a lifetime. That for once in our lives, all of us strangers were spreading peace, love, unity, and respect for each other in one massive event while the rest of the world worried about wars, greed, and violence. I came to EDC for YOU. There were a million moments when the entire crowd jumped up and down to the same type of music, the same DJ, the same song, at a speed of 75 bpm. Our hearts were beating for one thing. The celebration of music, art, and life, and we all have each other to thank for it. I had an amazing, unbelievable, unforgettable weekend. 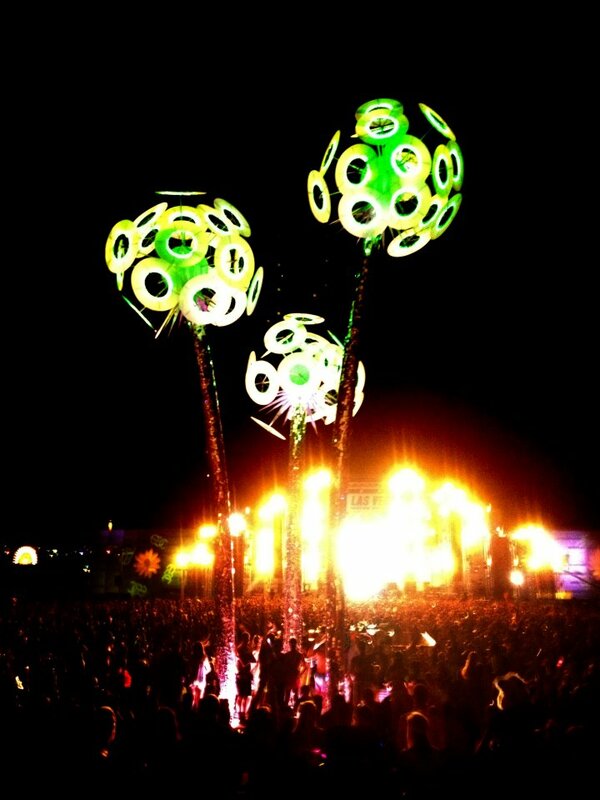 How was YOUR Electric Daisy Carnival experience this year?